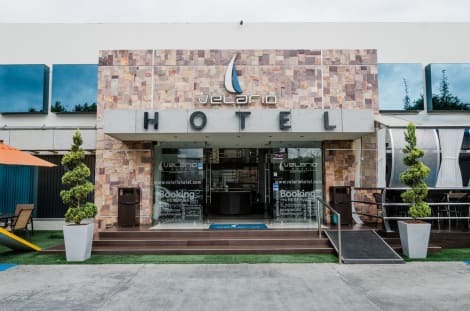 This hotel is 2.5 km from the city centre and 5 minutes’ drive of the United States border and the Tijuana International Airport. It offers 3 outdoor pools and free Wi-Fi throughout. Rooms at Fiesta Tijuana Hotel come with cable TV, fan and a private bathroom. The hotel has a large garden area as well as barbecue facilities. You can walk to Plaza Comercial Rio Square in less than 10 minutes from the hotel. Plaza Galerias Square and the Tijuana Cultural Centre is only 5 minutes’ drive away. Make yourself at home in one of the 30 guestrooms. Complimentary wireless Internet access keeps you connected, and cable programming is available for your entertainment. Bathrooms have showers and complimentary toiletries. Conveniences include desks and ceiling fans, and housekeeping is provided daily. Make yourself at home in one of the 51 air-conditioned rooms featuring LED televisions. Complimentary wireless Internet access keeps you connected, and cable programming is available for your entertainment. Bathrooms have showers and hair dryers. Conveniences include desks and separate sitting areas, as well as phones with free local calls. Satisfy your appetite for lunch or dinner at Del Sol, a restaurant which specializes in Mexican cuisine, or stay in and take advantage of the room service (during limited hours). A complimentary full breakfast is served daily from 7:30 AM to 11:30 AM. Make yourself at home in one of the 57 air-conditioned rooms featuring flat-screen televisions. Complimentary wired and wireless Internet access keeps you connected, and cable programming provides entertainment. Bathrooms have showers and complimentary toiletries. Conveniences include phones with free local calls, and housekeeping is provided on request. Enjoy a satisfying meal at La Villa serving guests of Hotel La Villa de Zaragoza. Cooked-to-order breakfasts are available daily from 7 AM to 11:30 AM for a fee. lastminute.com has a fantastic range of hotels in Tijuana, with everything from cheap hotels to luxurious five star accommodation available. We like to live up to our last minute name so remember you can book any one of our excellent Tijuana hotels up until midnight and stay the same night.